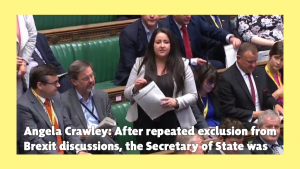 Lanark and Hamilton East MP Angela Crawley this week called out David Mundell for his “disrespect for devolution,” after the Secretary of State for Scotland floundered over whether or not the UK government had raised its Chequers plan with the Scottish Government in advance. 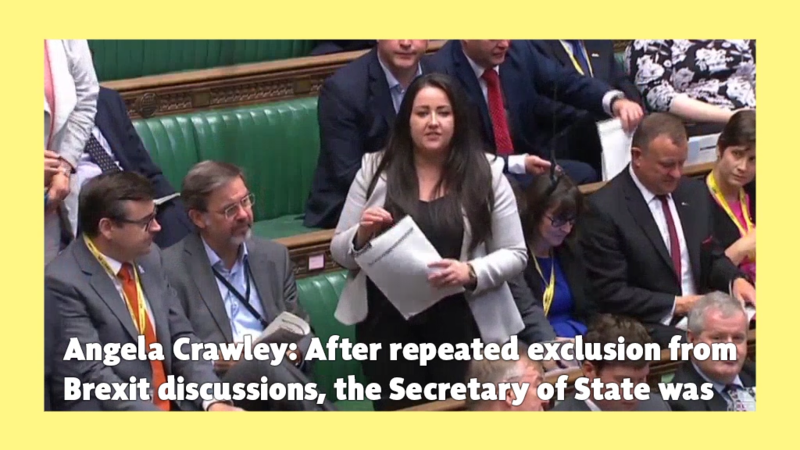 At Scotland Office questions in Westminster, Angela Crawley pressed David Mundell to end his government’s approach of side-lining the devolved administrations, and asked him to highlight what action he had taken to stand up for Scotland, in light of the Scottish Parliament refusing Brexit legislative consent. In response, David Mundell said he had highlighted the Scottish Government’s recent Brexit proposal at the Chequers meeting. “Theresa May’s Chequers plan demonstrates a change in direction by the UK government and one that will completely change the proposed arrangements for UK wide co-ordination after Brexit. Moreover, their agreement to prepare for a likely no-deal outcome highlights the treacherous Brexit path Scotland is being led down. “In his role, the Secretary of State has a responsibility to engage with the Scottish Government over the direction of Brexit, not continue his disrespect for devolution by side-lining the devolved administrations. I’m an MP, not a border guard.